And no, it's not too good to be true. When you haven't exercised for a while, it can be difficult to get back on track. You have to schedule in your workout time, force yourself to start moving, and basically rewire your thinking about fitness and working out. Even if you're a devoted gym-goer, finding the time can feel exhausting. While the 7-Minute Workout may sound like it's simply too good to be true, health and fitness experts say it works, especially if you've become more of a couch potato than a gym rat. "If you are new to exercise, or it's been a while, then this may be for you, as the 7-minute workout exercise is exactly just for that — it is designed for beginners or busy people to be able to perform this intense, short workout," Donovan Green, celebrity fitness trainer and author of No Excuses Fitness, told Medical Daily. "They can do it at home or work. Seven minutes is easier to do and is more efficient than a one-hour workout. It will boost your metabolism and increase strength during the workout. To see similar fitness and cardiovascular benefits, you can do calisthenics to martial arts." Brett Kilka and Chris Jordan introduced the 7-Minute Workout to the fitness community in May 2013, and since then a number of studies have backed up their initial claims. "The 7-Minute Workout is a short, quick series of exercises that use your own body weight. All body parts get the same amount of attention," Green said. 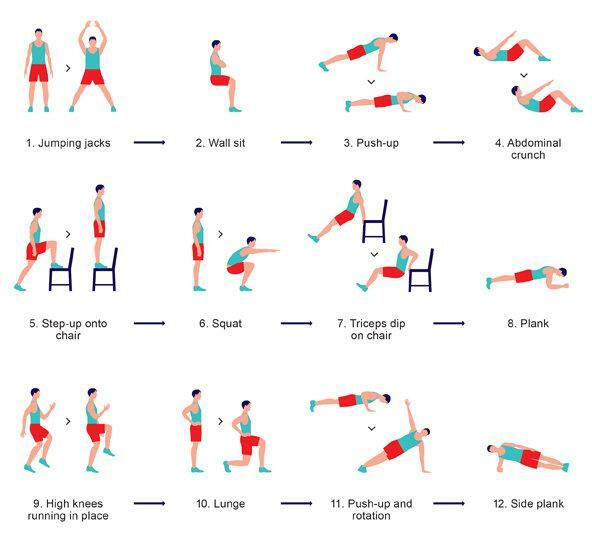 The 7-Minute Workout is made up of 12 exercises including jumping jacks, wall sits, push-ups, abdominal crunches, chair step-ups, squats, triceps dip on chair planks, high knees running in place, lunges, push-up and rotations, and side planks. There's no need for any expensive equipment or gym membership as the whole workout is made up of body weight exercises that only require a chair and a wall. The exercises are done for 30 seconds each with 10-second rest periods in between, and on an intensity scale from 1 to 10, the exercises should be done at around an 8. It's important to follow the order of the exercises and to not change it around as you see fit. The workout combines two of the most popular fitness routines: high-intensity interval training and body weight training. And it certainly doesn't take much time to complete. A sedentary lifestyle can lead to a variety of health issues including heart disease, diabetes, and certain types of cancer. The only way to stay healthy is to get off the couch and get active. With the 7-Minute Workout, you can get active and it won't get in the way of your already full day.